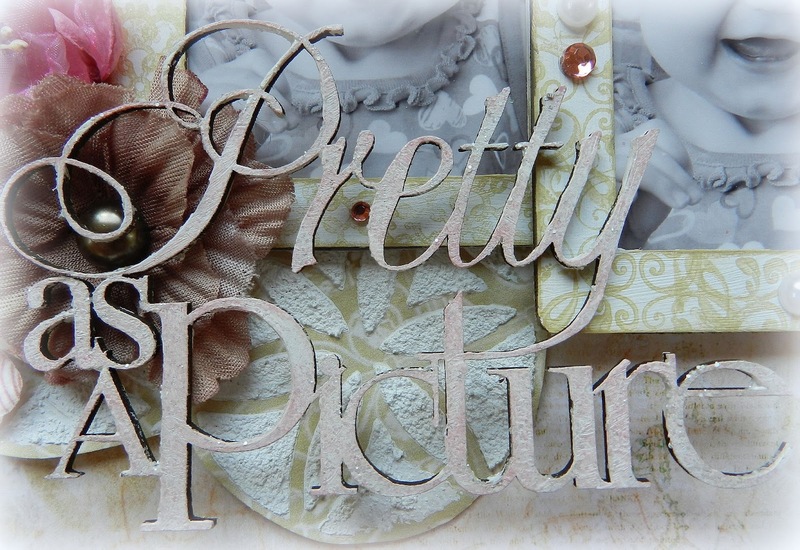 Absolutely loved this beautiful title piece, “Pretty as a Picture“. 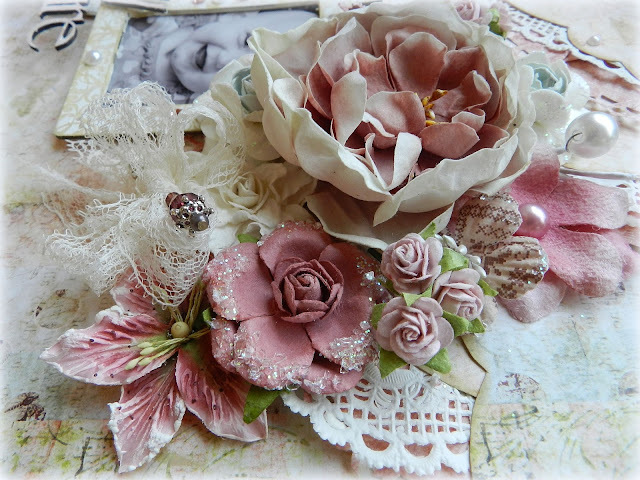 I’ve painted it with gesso, dabbed with some rose-colored ink, and then topped off with some white Stickles for a feminine glittery touch . Beneath my title and behind the small cluster, I’ve used the “Flower Pattern Stencil, small” along with some texture paste, which I cut out and placed behind my arrangement. 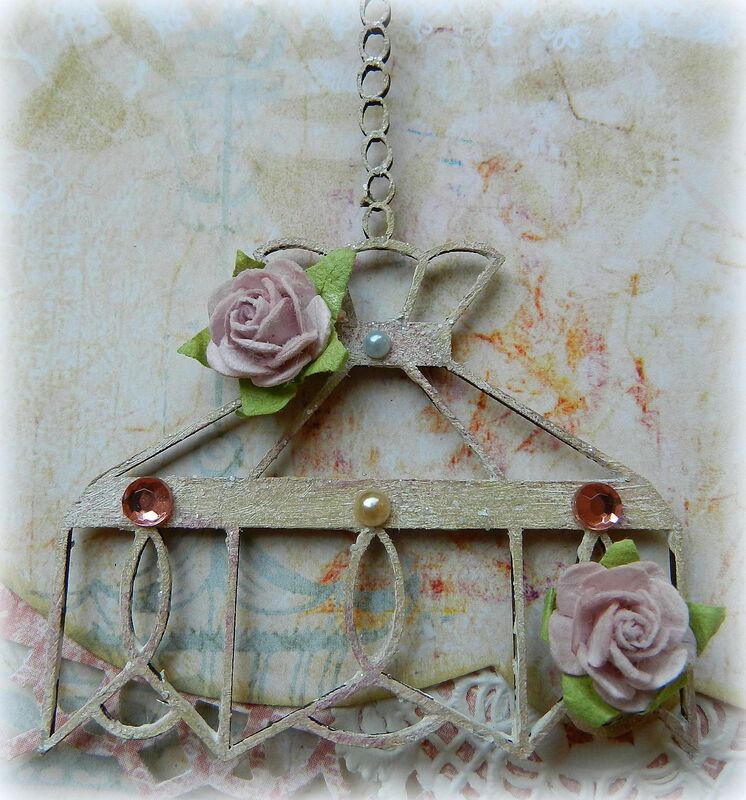 This lovely piece is from the “Lamp Shades” pack. I’ve painted it with gesso before topping it off with 3 different inks: rose bud, old rose, and shabby tote, and then finally finished with some Stickles. Add some bling and a couple flowers, and you’ve got one pretty embellishment! 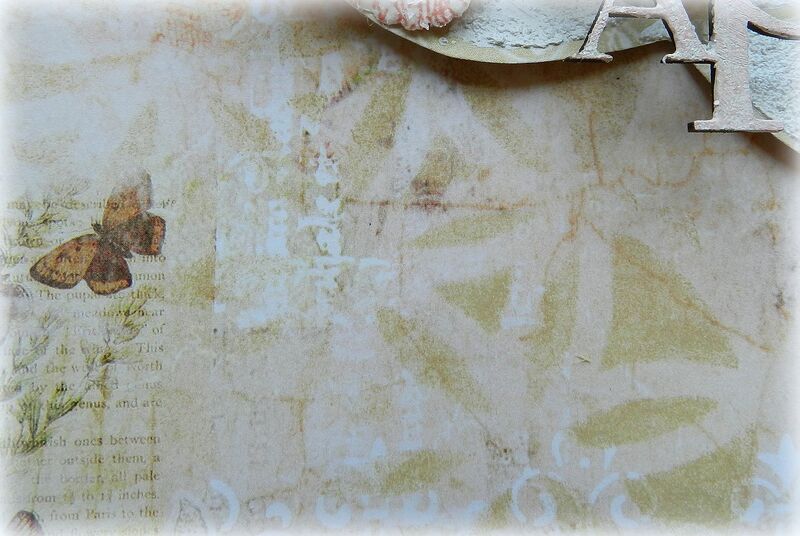 I’ve used the same stencil in the lower corners and along the top of my layout. Gotta love frames! These two actually came as a secondary frame in the packs of more “fancy” frames such as the “Decorative Frame C Classic“. These have been painted with a coat of gesso before using a couple different stamps to create the pretty designs you see here. Blings and pearls are all the more I needed . Just a closer look at my large flower cluster. Isn't that main bloom beautiful? I won it in a RAK from my Scrappin' Patch teammie Annelie Maddock :). Oh this is adorable, every inch of it, I am in love with your layers and all the girlyness on this layout... sigh.. it is all too cute for words! Wow! This is simply gorgeous!!!!! So elegant!!! 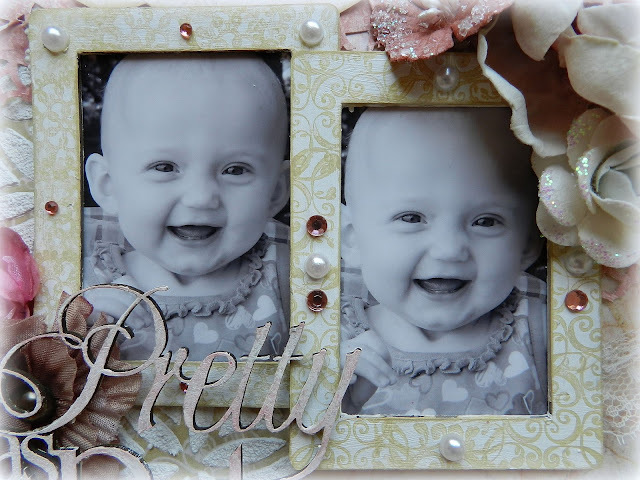 Love all of the layering and those pics of Aspen are priceless! Such a sweet smile! 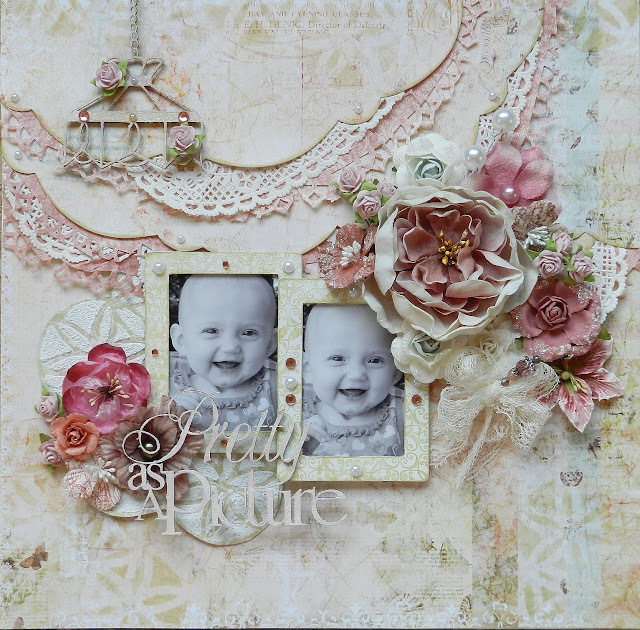 this layout just screams girly girl, so pretty and feminine, love it, and Aspen, she's just a little doll face! So beautiful! Thanks for sharing the details on how you achieve such stunning effects! Gorgeous page! 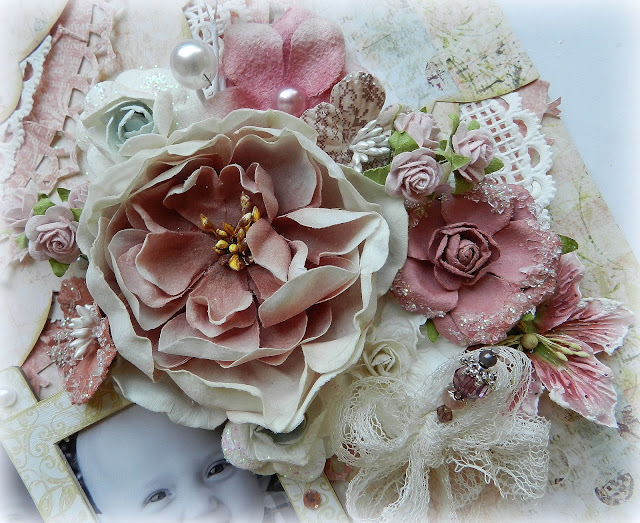 Love the soft colors and every little detail you made. Beautiful. 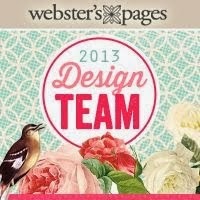 How adorable is this page! Wow, just an absolutely gorgeous layout! Really love the soft, feminine colours! And your girl is a doll indeed! Hi Erin! Always love seeing what you do! You manage to fit so much on your pages without it looking too much! Aspen is such a cutie she has such an infectious smile! I hope your jam turns out, how lucky you are to have raspberry bushes near you! Can't wait to see what you come up with next! Take care! 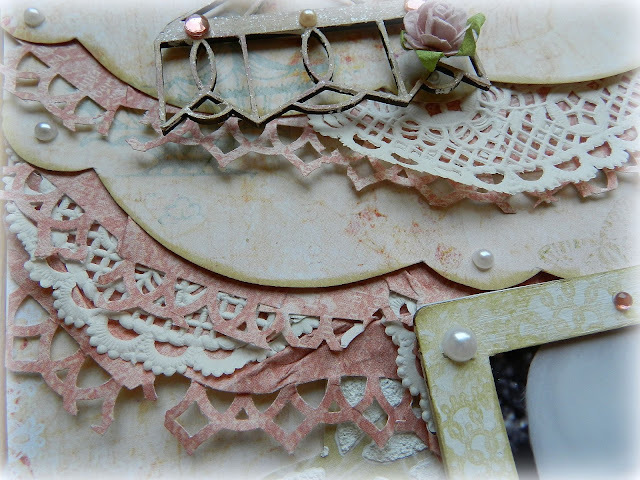 Gorgeous, muted colours, beautiful lacey doilies, glitter, and chipboard. Love this very pretty layout. OH! How TRULY GORGEOUS is this layout.... 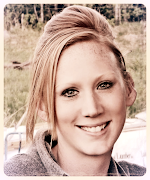 Always full to the brim with FAB details & that photo of your girl is SO BEAUTIFUL!! Love the all layered doilies atc,...such a fun new look! Gorgeous. Love the colours and the layers. So much detail to absorb. Mmmmm fresh raspberry jam - Yum! the textures and layers that you put into all of your work is just amazing!!! I love your work Erin. Just absolutely love it!! It's just magical! !